The nori culture system used to consist of bundles of bamboo or twigs, or rocks or concrete blocks, placed on the seabed for the monospores to settle on. The nori culture system used to consist of bundles of bamboo or twigs, or rocks or concrete blocks, placed on the seabed for the monospores to settle on. The materials with their attached monospores were then transferred to suitable sites such as inshore areas near estuaries, for the development of thalli to the desired size. But the most common method now is the use of nets with a large mesh, of 15cm x 15cm, and ‘blinds’ made of split bamboo, strung with ropes at intervals of about 10–15cm generally known as ‘hibi’. The spores are caught on these and transferred to suitable places for grow-out. Blasting rocky reefs or rock surfaces to alter depth and to expose additional surface for propagation is a common practice, particularly in Laminaria and Undaria culture. The scattering of broken pieces of rock also helps to increase substrate area and eliminate unwanted weeds.Artificial seeding was started when more was known about the life history of the cultivated seaweeds, and various types of nets and frameworks of braided strings are now used for this purpose. In commercial culture of Eucheuma in China, cuttings of the plant areinserted in sublittoral reefs by divers. A new method adopted in recent years consists of fastening cuttings to coral branches with rubber rings and dropping them on the reefs. Divers rearrange them if required. Raft and rack culture are practised in Japan and China. 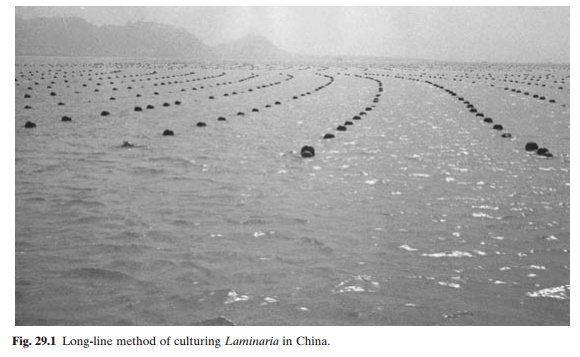 Brown algae, particularly Laminaria, are often cultured on long lines of ropes.An ingenious way of culturing Laminaria in China is the use of basket rafts, consisting of a series of cylindrical bamboo baskets tied together, each containing an amount of fertilizer which can be replaced when used up. Sporophytes are attached to the ropes tied along the sides of the basket. Instead of baskets, single rows of bamboo poles or synthetic tubing are also used to suspend young sporophytes, with earthenware jars containing fertilizer hung at intervals of about 6m. A system of polyculture of seaweeds (mainly Laminaria) has been developed in recent yearsin China on the Qingdao coast. Scallops are grown in lantern or pearl nets and abalones in plastic drums suspended from long lines between the seaweeds (fig. 29.1). Inorganic fertilizer is sprayed over the sea to improve the growth of seaweeds. The nutrients not used by the seaweeds serve to increase the production of algae which forms the food of scallops and abalones. disease and pest control. The culture of these species are largely for industrial use. Large-scale seaweed culture for waste recycling and industrial uses in North America has concentrated on growing unattached masses in race-ways and greenhouse tanks flushed with sea water. Raceways shaped in the form of a ‘V’ in cross-section or the usual ones with a single sloping bottom are used, with compressed air circulation. Experimental culture of the car-rageenan-producing red alga Hypnea in artifi-cial upwelling systems has given encouraging results. Nutrient-rich water pumped from depths of 870m into ponds was first used for filter feeding shellfish, and seaweed formed a secondary crop.